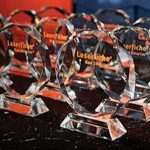 LONG BEACH, CA (January 16, 2014)—Laserfiche has announced the winners for the education category of its annual Run Smarter® Awards program. Babson College, which has an MBA program that has been ranked #1 in entrepreneurship by US News and World Report for 20 consecutive years, was a featured speaker during this morning’s keynote session at the Empower 2014 Conference. The college won a Run Smarter® award for using Laserfiche to automate the undergraduate application review process. Moving forward, it plans to expand the system enterprise-wide. University of Ha’il, the largest university in northern Saudi Arabia, is saving resources by using Laserfiche in conjunction with Apple iPads to create a paperless document approval system. University executives frequently use the popular Laserfiche Mobile app to take action on documents while they are in meetings. Frisco Independent School District won a Run Smarter® award for using Laserfiche to cut thousands of dollars in administrative operating costs and seamlessly handle of 7% boost in student enrollment without adding more staff. Washington Student Achievement Council uses Laserfiche Rio to automate and standardize the application process for student aid. The organization estimates a savings of $30,000 per year as a result.